Questscope is a social development organization (a 501(c)(3) organization and a British charity) registered in the Hashemite Kingdom of Jordan for social development in the Kingdom and the Middle East region. 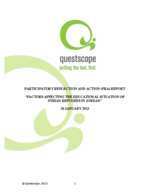 Questscope has been engaged in social development activity in the Middle East, primarily in Jordan, since 1991. These programs include mentoring incarcerated boys and young men at-risk, programs (primarily community centers) for young women at risk, and â€œnon-formalâ€ education, which is an alternative for youth who have dropped out of the formal education system to gain proficiency in reading, math and other skills and, if milestones are met, to get the Middle East equivalent of a General Equivalence Diploma (GED). As part of its social development activities, Questscope also manages job skills training and micro-enterprise opportunities. Most of Questscopeâ€™s work is accomplished through partnerships with community based organizations as well as government-level organizations.